Ozone Industries manufacture and service ozone generators in Australia to meet 21st century demands for a chemical-free alternative. Ozone Industries ozone generators produce naturally occurring ozone which is a very powerful oxidant and an ideal chemical-free disinfecting agent. The sale of the business was conducted by our Senior Associate using Lloyds Tender Process in conjunction with the application of Lloyds Target Marketing produced some spirited offers which resulted in a highly successful Trade Sale. As one of Australia's most arid states, and responsible for producing 14% of the country's agriculture, Queensland has an ongoing need for precise water management and water recycling. Different regions of Queensland possess valuable natural assets such as fertile farmlands, resources, tourism attractions or beneficial proximity to markets. The economic sectors most impacted by the need for water recycling are is Agriculture, Outback tourism and Minerals. The average shower consumes 100 - 150 litres of water. Per person, per day, a toilet uses approx 15 litres of water. Washing machines use an average of 50 - 70 litres per load. The kitchen sink takes roughly 40 litres of water per day for preparing food and washing. Now consider the agricultural / commercial applications of water. The quantity of water required in order to successfully run a commercial farm is incredible! When we think of water usage on a farm, we may think of watering crops. However the amount of water needed on a dairy farm is ever greater. Animals (pigs, chickens, cows and sheep) all need drinking water to stay alive. These animals obviously need food to stay alive, which requires water to grow before being edible. Water is also used in the transition from animal to meat product, and then in the cooling systems to keep the meat products fresh. Grain and vegetable crops require water. Water is used in a variety of applications - spreading fertilizers and pesticides, which result in greater crop yields. Water is used on farms mainly for irrigation. Studies show that by using drip irrigation, farmers can conserve up to 60% of the water that it would normally take to irrigate a crop in comparison to using an alternative systems of irrigation. 100 litres of water to produce just one ear of corn. 300 litres to produce one egg. 3000 litres of water to grow a bushel of wheat. 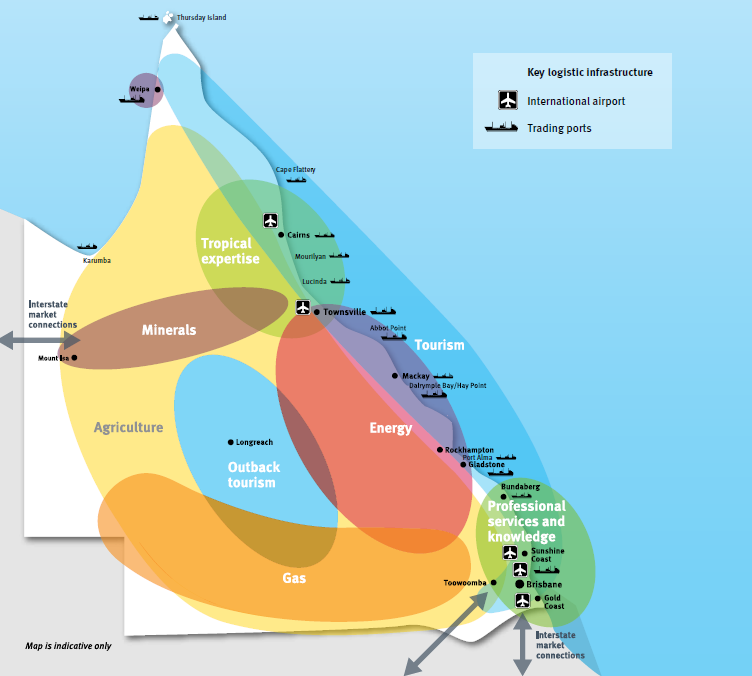 Source: Queensland’s broad economic zones as per Queensland Government's "Infrastructure Plan Part A: Strategy March 2016"
Queensland's economy has been undergoing structural diversification and evolution over the past decade. In summary, it has been transitioning from a historic resources based economy, to a new diversified economy of various growth drivers. 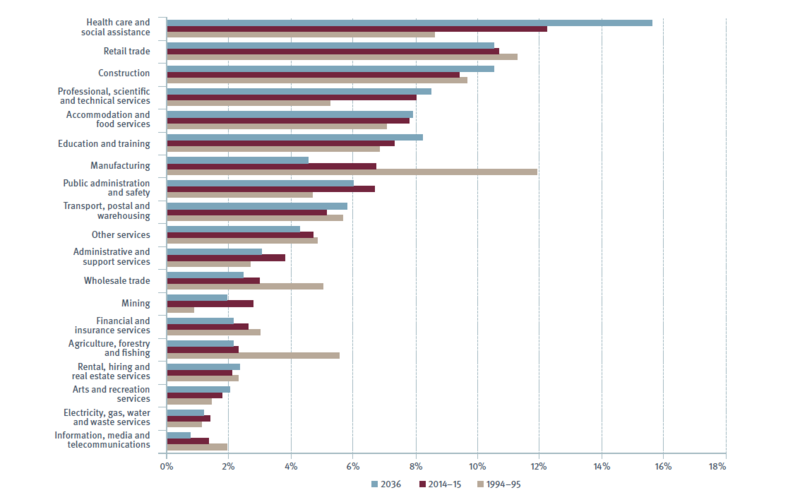 Although the resources sector will continue to play a big role in contributing to Queensland's economy over the coming decades, the shift towards activity and employment basedservices (in particular health, education, professional services and tourism-related industries) is gradually playing a more dominent role year on year. Queensland's various industry areas (and the supply chains that support them) have different needs for infrastructure spending. For example, coastal regions that attract international tourism require marine, preservation and aviation infrastructure spending. Meanwhille, while agricultural areas and resource production need access to cheap resources (water, energy, gas) as well as access to domestic and international export markets through effective integrated supply chains. The above vital sectors impact the everyday essentials for queenslanders, such as access to cheap food and energy, as well as the availability of jobs in Queensland.